FASTPORT CEO Bill McLennan (left) and Brigadier General Jessica Meyeraan (right) display MOU between the organizations with 29 employers gathered at the Pentagon to sign ESGR Statements of Support. In a joint effort to provide real economic opportunities to the National Guard, the National Guard Bureau Joint Staff and FASTPORT signed a Memorandum of Understanding (MOU) that delineates a strategic partnership created to explore, promote, and improve military hiring initiatives in multiple industry sectors. The signing ceremony took place at the Pentagon where 29 employers joined to witness the signing as well as sign their own Statements of Support for the Guard and Reserve. Because military service members have unique skill sets that equip them for successful careers, employers have united to inspire and hire these talented men and women. Hiring military talent makes business sense. And that military talent does not end at those who have completed their service. Citizen Soldiers in the Guard and Reserves are disciplined and skilled workers who display pride, leadership, responsibility, and professionalism in all they do. They need and deserve great employers to support them with meaningful career opportunities. These talented Citizen Soldiers can find great career opportunities at https://vetfasttrack.org/. To join in this employer network to help employ members of the Guard, please visit fastport.com/employers. December 16, 2015 - Pentagon, Washington, D.C. - Following record-shattering employer participation in previous ESGR Signing Ceremonies at the Pentagon, the Mid-American Trucking Show, and the Great American Trucking Show, FASTPORT coordinated with industry leading employers from around the country in multiple industries to display their continued dedication to our nation’s heroes and to publicly affirm they are ready and able to stand as first-responders in military employment. The National Guard and Reserves are fundamental to our nation’s defense, and the health of this foundation depends in part on employers who support enlisted men and women as they fulfill their military duties. Military talent in general is a coveted asset for these attending employers, and members of the National Guard and Reserve offer an additional benefit: they are immediately eligible for employment. For companies ready to make military hiring a priority, looking at the talent pool in the Guard and Reserve is an ideal place to start. You can see in the graph below that that pool is much larger than many employers imagine. 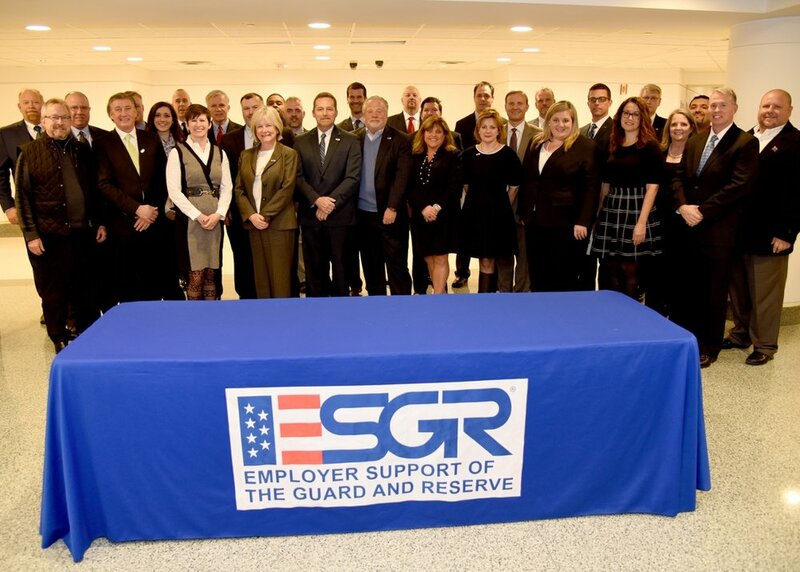 FASTPORT President Brad Bentley poses with ESGR and DOD staff after signing the Statement of Support. The ESGR Signing Ceremony is an annual event that will take place the day before Wreaths Across America Day. If you are interested in participating in next year’s signing ceremony, please get in touch with Paige Thompson at paige.thompson@fastport.com.